Shepard Smith has been bestowed with the dubious title of “most likeable anchor on Fox News,” and the popular breaking news chief won even more points for defending competitor CNN against PEOTUS ranting. 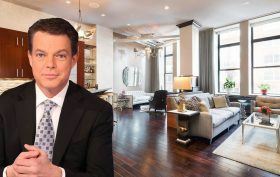 But he’s also looking to get some real estate points by selling his Greenwich Village apartment at 65 West 13th Street for $4.9 million (h/t Luxury Listings). Smith bought the 2,341-square-foot condo in 2004 for $1.875 million, briefly listing it for $4 mil in 2011.